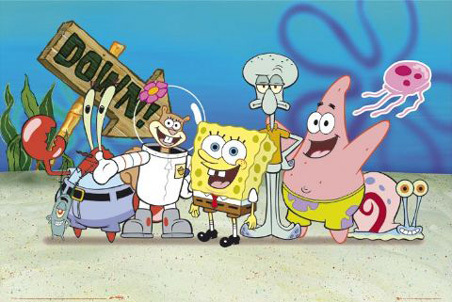 I have a confession to make: of all the television shows that I watched when I was growing up, my favorite will always be Spongebob Squarepants. I cannot help it. It is the most quotable, upbeat, and charming series that I have ever watched. It takes absolutely no effort to pay attention or follow the plot and is still my escape when I am stressed, sick, or needing a break from reality. When thinking of ideas for blogging, this show stuck out to me as it is so popular among both girls and boys, a feat that even Disney was not able to achieve with its beloved princesses. Although this show does contain many positive morals about work ethic, friendships, and being independent, after re-watching multiple episodes, I realized how many stereotypes and little gender equality is present. First of all, almost all of the characters on the show are male and have some pretty serious flaws that do not teach good lessons: Mr. Krabs is greedy, Patrick is unintelligent, Spongebob is gullible, Squidward is condescending, Plankton is envious. The only character on the show that does not really have any bad qualities is the only female: Sandy. Throughout the show, she is only ever a good friend of Spongebob’s. I like how women are so empowered by this character, but it is also sad at how much men are put down (and how much little boys are shown that ALL men act like this?). Although I have multiple episodes in mind, one specifically stands out as being ultra-gender stereotyping and assigns such obvious roles to males and females that I, and many other people who have complained about this episode, was honestly offended. In “Rock-a-bye Bi-valve”, Spongebob and Patrick discover a baby clam without any parents and decide to raise it as their own. To be funny, the show depicts Spongebob and Patrick taking on the parental roles: Patrick as the dad and Spongebob as the mom. This seems harmless in the beginning, but later in the episode begins to turn into very blatant stereotypes. 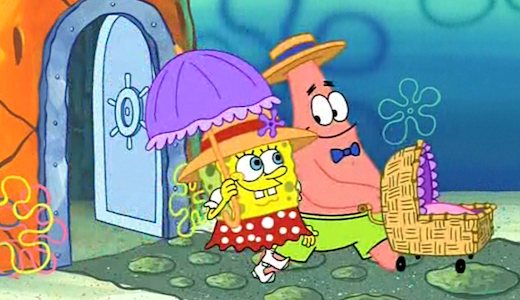 Patrick goes off to work, leaving Spongebob to take care of the clam, clean the house, and cook dinner. Every night he returns from work “exhausted” and cannot help take care of this clam that he equally agreed to raise. What does this teach the young children who are watching this? For boys, if they grow up and get a job that they work hard at they do not have to help around the house as well? For girls, that if they raise a family they will end up being overworked and abandoned by their spouse? Re-watching this episode was horrifying, especially seeing how I did not see anything wrong with it when I watched it as a child. I agree with you about the characters. Another female character in the show is Pearl, Mr. Krabs' daughter. In many ways she portrays the stereotypical female "daddy's girl" in that she gets whatever she wants or she'll cry. This definitely does not present a good model to young children, especially to young girls who will think that they can get anything from their parents if they cry and beg for it. I also agree that this episode is horrible and promotes gender typing in the worst way. Children watching this can start to compare their own parents to this. I feel like shows like Spongebob which appeal to both children and adults need to start being more careful with what they show. Though to adults it can be seen as funny, children can learn unhealthy stereotypes. Isn't it unnerving how we re-watch old favorite TV shows and realize how easily we could have been/are brainwashed into accepting these gender stereotypes? Earlier posts about children advertising and Disney movies and now this post show how prevalent gender stereotypes are in young children's media. 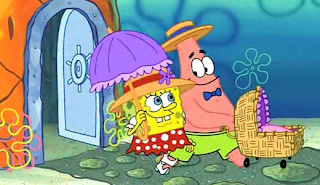 As for the specific SpongeBob episode you mentioned, I must say that it is crazy how completely blunt the show is about "the father goes off to work and the mother stays home to tend to the house and children." It makes me wonder: Were our parents watching these shows with us and paying attention to what was being taught? Or did they just assume, since it was on a kid's channel, that it would be relatively innocent and safe to watch? Or maybe they did watch these shows with us, (I know my mother did on occasion,) and just didn't strike them that the themes of the show were a bit manipulative and unfair? Lastly, if you were a parent today, would you turn off the TV on one of your child's favorite shows because of an episode like this? For me, I'm not quite sure. If the episode doesn't have a lot of violence, maybe I just wouldn't pay attention as much. I suppose that shows my ignorance. However, after this class, I will try and make more an effort to truly analyze what these shows are teaching children. Another female character is Ms. Puff, the passionate teacher who repeatedly allows Spongebob to re-take her class, and is repeatedly left exhausted, injured, and/or incarcerated. The passion and forgiveness are great, but it's a shame that Spongebob (albeit unintentionally) walks all over her. However, I have an objection. You say that these male characters are setting bad examples for young male watchers to follow, but you're forgetting that you can learn as many positive lessons from a poor role model as you can from a stellar one. (Personally, I learned everything I know about how to avoid trouble by observing my older siblings be grounded time and time again.) All young male watchers (and female, for that matter; everyone should avoid greed, ignorance, etc.) have to do is see these characters, watch them fail because of their character flaws, and learn to avoid acting like them. Note that this episode teaches that those demonstrated mother/father stereotypes are NOT successful, since Spongebob & Patrick end up fighting and almost killing their clam. The episode teaches that teamwork is crucial, and that parents SHOULD unite in their base love for their child. I do not see a bad message in this episode. In fact, I came across this very interesting article that suggests that each character represents one of the seven deadly sins. It proposes that the deadly sin Sandy represents is pride. Although I am not sure if the show purposefully chose to have each character represent one of these seven deadly sins, I would agree that each character has an obvious flaw. Children when they watch this show can clearly see these flaws, and learn moral lessons through the characters’ mistakes. I agree that that episode, and perhaps the whole show, blatantly portrays gender stereotypes. However, the interesting thing is how they are presented. I agree with "xoxo, GossipGirl" in that the episode successfully debunks gender stereotypes. By presenting these comical examples of the classic mother and father figures, the show sends a message to kids that while these stereotypes may exist, they are definitely not the best or only way for people to act. If kids grow up seeing humorous representations of stereotypes, they will be less likely to take them seriously and more likely to disregard them as simply something funny that Spongebob and Patrick acted out.